Monterey utilizes forward drive to launch surfing boat with pizzazz. Taking advantage of Volvo Penta’s Forward Drive innovation, wakeboat manufacturers have been able to tap into watersports’ fastest growing activity: wakesurfing. Turning the props forward and tucking them well under the hull has made it safe for sterndrive boats to accommodate wakesurfers, and the 25-foot, 10-inch MX6 Surf Edition from Monterey is one of the latest to join the club. Attached to the Forward Drive is a 6.2L Volvo Penta V8-430-CE EVC gas engine that cranks out 430 hp and uses variable valve timing to maximize torque, which is essential to get boarders up and going. 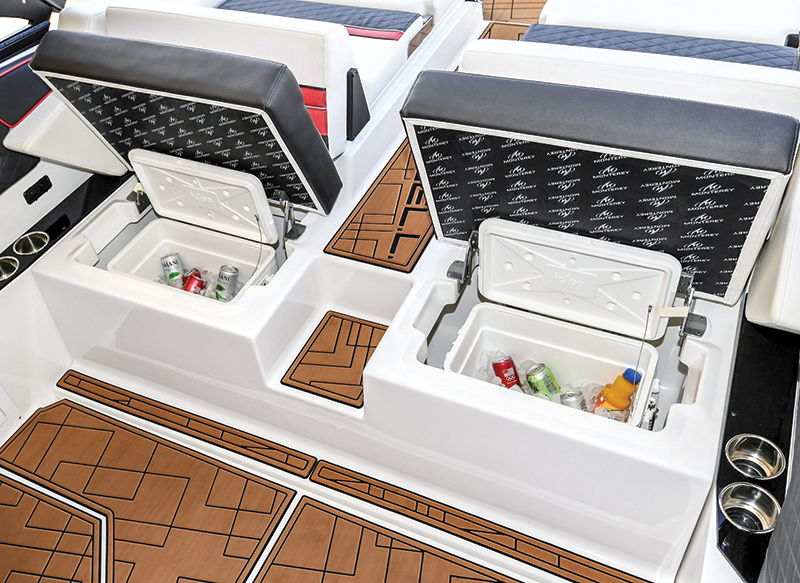 The MX6’s integrated swim platform, featuring a hidden boarding ladder, is deep enough to serve as the staging area for participants, and twin rear-facing cockpit lounges can accommodate sunbathers or observers. Forward of the lounges — part of them actually, and separated by a backrest — are two doublewide bench seats, each with a cooler built in to the base. Another aft-facing lounge stretches along the port side, opposite the helm. The bow has seating for five people around a round table. The boat’s 5,400-pound hull is a good start toward wake building, and its 2,200 pounds of available ballast and surf tabs increase wake height. At the helm, the driver has access to the Zero Off GPS speed control, which can be preset to each rider’s preference to deliver the best pull possible. 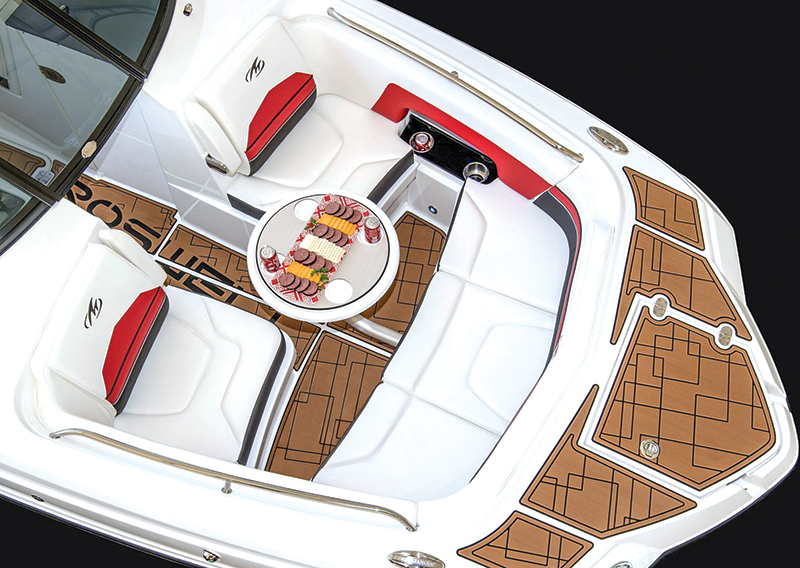 To maximize comfort on board, SeaDek flooring is available. The wake tower comes with cam assist, for easy raising and lowering, and a Bimini to provide shade. A portable toilet is standard, but an electric head system is an option.